Many who wear their hair relaxed often ask if they need to cut the relaxed hair in order to get Sisterlocks, not necessarily, you can start your Sisterlocks with approx. 3 inches of new growth. The new growth will be locked only because chemically altered hair will not lock. The relaxed ends can be styled and as the locks mature they can be trimmed. 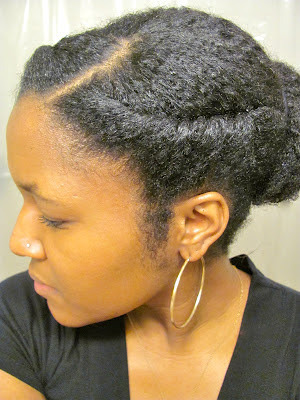 Many choose to transition from a perm to Sisterlocks by wearing protective hair styles. Wearing protective hair styles can help prevent the hair from breaking at the point of demarcation, demarcation is where the permed hair and new growth intersect . Unfortunately many of these styles are left in for long periods of time and when taken out the hair is often lacking moisture and breaks easily. The key is to not leave the styles in for more than a few weeks, some will leave their protective hair styles in for months at a time, this leads to matting and breaking. Once the protective style is taken down the hair must be shampooed and moisturized with the proper products before the hair is put back into it’s protective style. Hair grows approx. 1/2 inch per month for most, so be prepared to stay with this routine for at least six months to get the desired length needed to start your Sisterlocks. Once the desired length is achieved the permed ends can be trimmed off or you can keep them and trim them after you reach your desired length with Sisterlocks. Cornrows flat twists and individuals braids are great protective hair styles provided that they’re not done to tight or left in to long.